The 668-ton, steam-propelled Light Ship Barnegat was designed and built by the New York Shipbuilding Company in Camden, New Jersey, in 1904. The ship, currently docked at a private marina in Camden, is 130-foot long with a 28-foot beam. 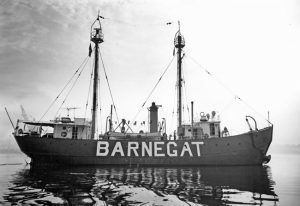 As a light ship assigned to the Barnegat Station, its role was to warn commercial ships along the New Jersey coast of shallow water and shoals in order to avoid strandings or sinkings. Two masts, each of which contained three oil-fed lanterns; a steam-chime whistle that blasted every 20 seconds; and a submarine bell were employed to provide the warning. The ship was first posted from 1904-1924 at Five Fathom Bank near Cape May Lighthouse. It was then used as a relief Light Ship for two years before being permanently posted to Barnegat from 1927-1942. During the closing years of World War II, it was withdrawn temporarily to serve as an examination vessel at Edgemoor, Delaware, where it would intercept all vessels entering the Delaware River to determine the ship’s identity, cargo, homeport, and last port of call before clearing them to proceed. 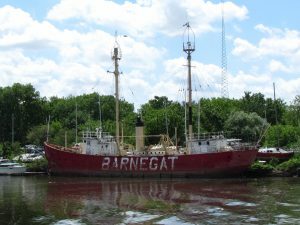 Following the war, the Barnegat was returned to service at the Barnegat Station until its decommissioning in 1967. Later that same year, the light ship was donated to the Chesapeake Maritime Museum in St. Michaels, Maryland. Unable to afford the maintenance, the Museum sold the ship to the Heritage Ship Guild in 1970 to be used as part of a floating display at Penn’s Landing in Philadelphia. Since it was docked in Penn’s Landing, the Barnegat was listed on the State and National Registers through the Pennsylvania process in 1979. The light ship remained there through the 1980s until the Guild disbanded and sold it to the owner of Pyne Poynt Marina in Camden. The marina’s owner intended to refurbish the ship and move it to the Camden waterfront; but due to lack of resources, the vessel currently sits in dire need of maintenance and repair. If action is not taken soon, the ship is at risk of demolition by neglect. Other saved and rehabilitated light ships can serve as a model for the Barnegat. The National Trust for Historic Preservation sponsored a national campaign to save and maintain the Light Ship Nantucket, which was built thirty years after the Barnegat. That ship has been restored for use and can be chartered for touring and parties. Delaware’s Light Ship Overfalls is currently being restored in Dorchester, New Jersey by the Overfalls Foundation. Historic maritime resources are both precious and fast disappearing. Experts in the field are available to assist in rehabilitation, such as the “Dirty Hands Gang,” who is restoring the Light Ship Overfalls, along with preservation grants. PNJ recommends that the owner proceed with retaining a preservation architect/maritime engineering team to prepare a Preservation Plan for the Light Ship Barnegat. The plan, prepared in accordance with the standards of the NJ Historic Preservation Office, would assess current conditions, provide prioritized recommendations for repairs, identify the associated costs, help determine a sympathetic nonprofit organized to spearhead its restoration, and serve as a valuable tool for raising funds for preservation. The Light Ship Barnegat would add great interest and variety to the Camden waterfront. PNJ encourages the owner to proceed with assessment and fundraising, and to publicize its efforts to do so.